Sir Arthur Conan Doyle’s detective genius, Sherlock Holmes, came to NBC radio in 1930 starring Richard Gordon. By 1939, Basil Rathbone was heard as Holmes with Nigel Bruce as Doctor Watson. The duo was simultaneously starring in a popular series of Sherlock Holmes features for Fox, and later for Universal. By the end of the feature run in the mid 1940’s, Rathbone was eager to separate himself from the radio show to avoid being typecast, and even though the show’s sponsor (Petri Wines) offered him generous pay to continue, he decided to move on. Tom Conway took over with Nigel Bruce continuing as Watson (in this paring Nigel Bruce received top billing). Tom Conway and Nigel Bruce were replaced in 1947 by John Stanley and Alfred Shirley. Others to portray Holmes and Watson over the radio run were George Shelton and Ian Martin and Ben Wright and Eric Snowden. In 1955, NBC signed heavyweights Sir John Gielgud and Sir Ralph Richardson to star as Holmes and Watson, but with radio fast giving way to television, it only lasted one season. 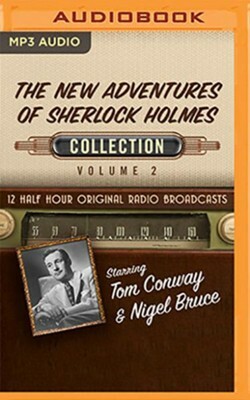 Here are 12 exciting adventures of Sherlock Holmes (the first two episodes star Tom Conway and Nigel Bruce and the remaining ten episodes star John Stanley and Alfred Shirley). I'm the author/artist and I want to review The New Adventures of Sherlock Holmes, Collection 2 - 12 Half-Hour Radio Broadcasts on Radio Broadcasts (OTR) on MP3-CD.